.o0° Quantum Leap Books - Novels °0o. September, 1981. 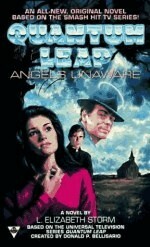 A little girl named Teresa Bruckner is visited by an angel - a man in strange clothes, who says his name is Al. He sings her a lullaby and promises to come back someday, before vanishing in a flash of blue light. April, 1995. Teresa Bruckner is no longer sure she believes in the angel named Al. In fact, she doesn't know what she believes in anymore. So she goes to a peaceful New England monastery to rest and think and plan. And, according to Ziggy, to die. This book is dedicated to William C. Willard (November 20, 1994), James O. Norton (December 7, 1994) and Katherine Postak (March 30, 1996). May Light perpetual shine upon them. I gratefully acknowledge the hospitality, prayers, and support of the sisters and brothers at St. Scholastica's Priory ans St. Mary's Monastery, Petersham, Massachusetts, and of the brothers of St. Benedict's Abeey, Still River, Massachusetts, upon which the fictional St. Bede's was modeled. Ginjer Buchanan, editor, who always has the right word at the right time. Charles and Stephen Willard, for their geographic and meterological research. John, John, and Reverend John, who have given support and love during this past year, each in his own way. About the Author: L. Elizabeth Storm also wrote the QL novel Pulitzer. A very well written, intriguing book that never ceases to be exciting up to the very last page. I like Mrs. Storms writing style a lot. She also seems to have a special liking of tying together loose ends left in the series, as she did in Pulitzer. Here, she offers a possibility what might have happened to Teresa Bruckner after they left her as a little child. Angels Unaware also offers you deep emotions as Al wrestles with the demons of his past. His character, I think, is hit just right. Though I liked Pulizer better, as it focuses on Al's coming home from 'Nam, I much enjoyed the neat dialogue and well-constructed story line. It's a little too wrought with Catholicism for my taste, as I'm not a Catholic, but that didn't keep me from enjoying the novel. Airports, Sam Beckett decided, were decidedly not his favorite places to leap into. Voices called out through crowds of talking heads. People moved in waves, and anyone not moving with them was drowned in the surge. Lights flared all around him: from glowing signs, from windows, reflected off planes outside, from flashing cameras, from expensive watches and fluorescent lights. It was a sensory overload to Sam, who wasn't yet sure what senses he had, much less which ones to trust. Sighing, Sam closed his eyes for a moment, tried to gain his bearings, and decided to take stock of his situation. In one hand he clutched a heavy black satchel and smaller overnight case; from the other, dangled a garment bag. Pushed upstream by the tug and press of the people around him, he moved along with the men, women, and children who, like him, were leaving the plane and scurrying toward friends, relatives, and business associates. He watched their frenetic activities, trying to isolate clues to his where- and whenabouts, hoping for someone to call out to him, recognize him, begin him on his new assignment. What he gathered first - aside from the luggage in his hands - left him cautiously pleased. He knew this place! He'd been here before. Logan International Airport. He'd flown in and out of this place at least half a dozen times during his years at MIT. The gentle "ah" that replaced the "r" sound in the New England babble around him reminded him of long, happy hours spent in the company of New England and students and seekers. The terminal was filled with sights and sounds and smells from all over the world. But what caught his immediate attention came from across the corridor by the arrival gate. His stomach growled: either he or his host were very hungry, and at the moment it didn't matter which. What mattered most right then, even more than finding out who he was, or when, or why, was answering an old, familiar yearning. He wanted a hot dog. A cheap hot dog sold at an exorbitant price. A hot dog with mustard and onions. Grinning, almost childishly happy, he began picking his way through the crowd, homing in on the familiar smell from the café. He looked around, still listening for other clues that might be important, and watching for anyone trying to catch his eye. Then his gaze lit on the date flashing on a status board, and he shivered. The clear, high-pitched voice at his shoulder startled him, and Sam turned too quickly. His garment bag flew outward and met resistance. The resistance grunted. "Oh, uh, excuse me, I'm - I'm sorry..."
Sam put his bags down and grasped the woman to steady her. As he did, three things registered almost simultaneously: he'd hit a nun; the nun was the source of the high-pitched call; and she'd been calling him.